1. Turn off the computer. If you are unsure whether the computer is off or in Hibernation, turn the computer on, and then shut it down through the operating system. 2. Disconnect the power from the computer by unplugging the power cord from the computer. 3. Disconnect all external devices from the computer. 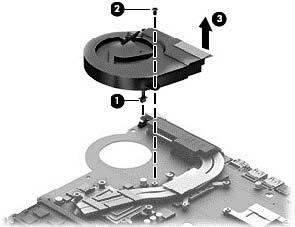 If you don't know how to do, please contact us, we will email you the HP official Disassembly Manual. 1. Turn the system board upside down with the front toward you. 2. Disconnect the fan cable (1) from the system board. 3. 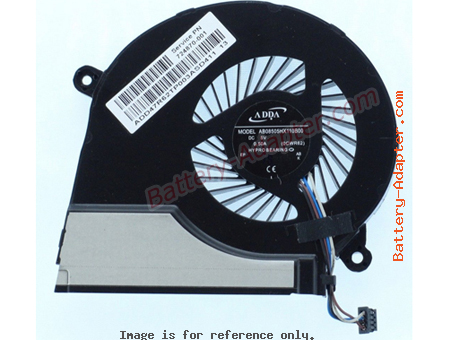 Remove the Phillips PM2.0×5.0 screw (2) that secures the fan to the system board. 4. Remove the fan (3). Reverse the procedure to install the new fan.